The Tailgate for Teammates, happening September 17, is an annual event that takes a different spin on a fall gala. Rather than the dress up black tie event, it is a much more laid back event that has the athletes of Iowa focused. The evening is filled with games, laughter and best of all inclusion – which is a huge focus for Special Olympics. 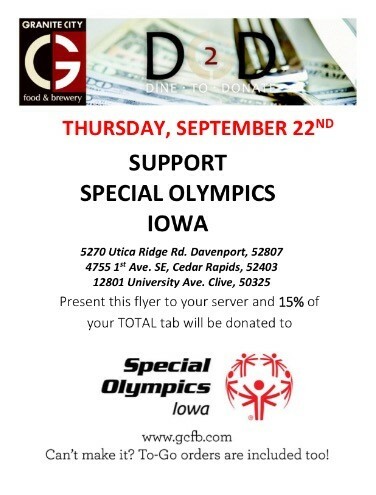 On Thursday, September 22 you can support Special Olympics Iowa by presenting the flyer below to one of three Granite City food and brewery locations in Iowa! 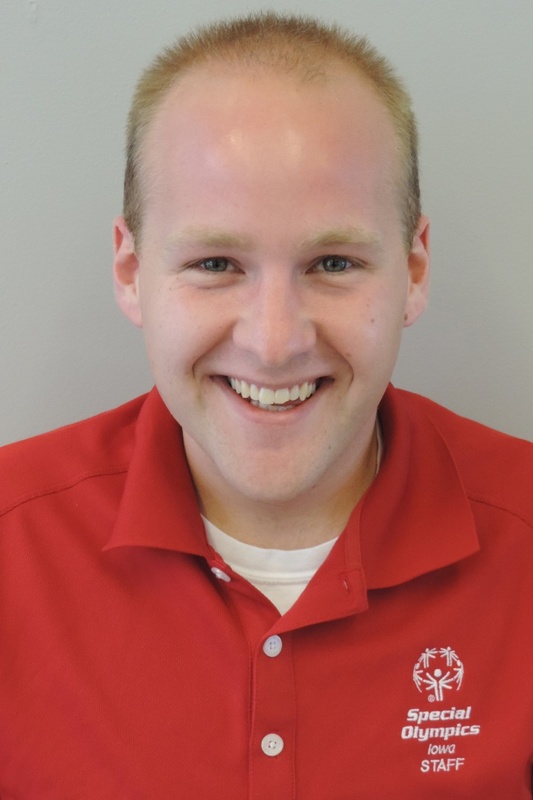 As the schools and facilities start gearing up for another fantastic year of Special Olympics Iowa sport competitions, I have one item to refresh/remind you on – the Class A Volunteer Application. 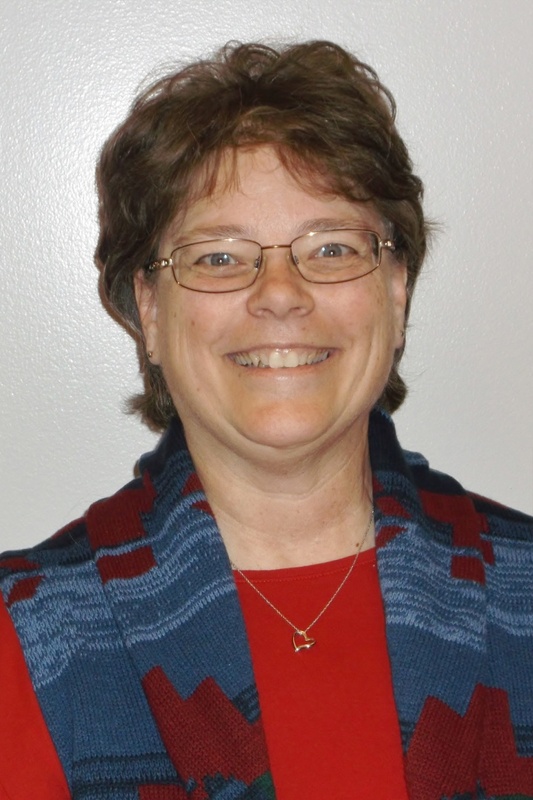 My name is Sally Briggs and I process all the Class A applications. We have updated our website with the Class A Volunteer information. From the home page hover over “Get Involved” and click on “Class A Volunteers” or use this link. Who should fill out the Class A application? Law enforcement officers will stake themselves atop 18 participating Dunkin’ Donuts locations across the state of Iowa on Sept. 9 to help raise money for Special Olympics Iowa (SOIA) in the 2nd annual Cop on a Rooftop event. “Cop on a Rooftop” is a unique fundraiser where local officers stand on the roof of a local business while volunteers help collect donations at the entrance and drive-thru of the business. You’ll be able to get a free coffee coupon from participating Dunkin’ Donuts stores when you make a donation to SOIA. This event is one of many planned and implemented each year by the Law Enforcement Torch Run (LETR) in support of SOIA. 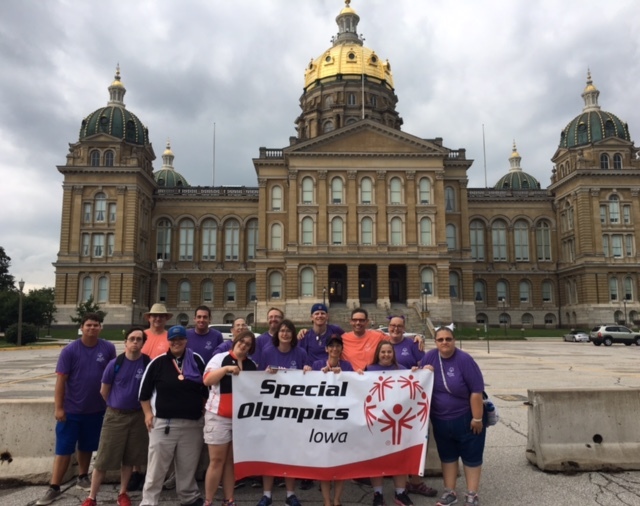 Special Olympics Iowa is looking for a volunteer to help translate important documents into Spanish for future use. We have several forms, including our Physical and Consent form, that we would like to also have in Spanish on our website and available at the state office. If you or someone you know would be interested in helping with this, contact Gary Harms at 515-986-5520 or gharms@soiowa.org. 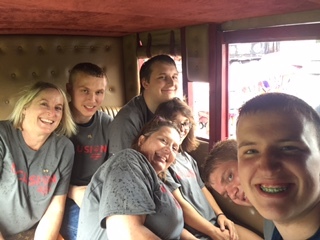 Special Olympics Iowa athletes had several opportunities to display their accomplishments this year at the 2016 Iowa State Fair. On Wednesday, August 10 athletes and their families were invited to take part in the annual State Fair parade that kicks off the fair. Athletes held up banners and waved at parade watchers as they made their way from the Capitol Building in downtown Des Moines to the State Fairgrounds. 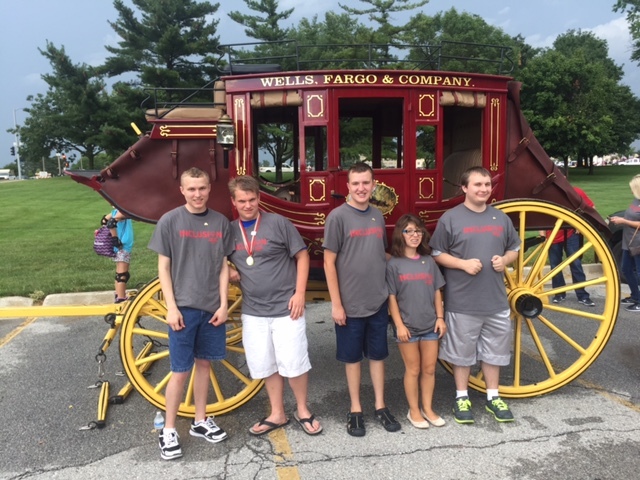 Our Statewide Partner Wells Fargo was also on hand at the parade that day as they let SOIA athletes ride in the Wells Fargo stagecoach. Come join us for a fun day of adaptive activities and INCLUSION at the Iowa State Fair! On Friday, August 19 from 9 a.m. to 2 p.m. at the Grand Concourse at the State Fair, Special Olympics Iowa, along with our friends at Adaptive Sports Iowa and Courage League Sports, will host “Adaptive Sports on the Grand Concourse.” The event will be a day of fun promoting understanding and tolerance as a way of narrowing the gap between those of varying abilities. Athletes are invited to come out and take part in activities like bocce, bowling, wheelchair basketball, power soccer and more. There will also be equipment demonstrations and information about each organization and how to get involved with them.